Welcome to day two of beach week! Let's talk about what to bring in your beach bag! There are a few necessities that no girl should be without at the beach, chief among them is sunscreen! I won't go into all the details of skin cancer and will just say that sunscreen is your friend. I haven't always been a sunscreen advocate because I never burn, but I know that even though I'm not burning my skin is still at risk so I make sure to use it when I'll be in the sun. Always have some with you and reapply throughout the day! Now onto the more fun items! Ready? Set? Let's Go! Shopbop has an awesome selection in all price ranges! Sunglasses: You can't be without a chic pair of eyewear, but be careful not to get a sunglasses tan! Check out net-a-porter for a HUGE selection of sunglasses! Target has an amazing selection of floppy hats in a variety of colors! Book/Magazine/Word Puzzle Book: You'll need something to occupy you when you aren't walking along the smooth sand, people watching or frolicking in the water! Towel: I think this is pretty self explanatory, but make sure your towel has a fun print/color or design! Once again, head to Target for tons of fun towels! Water: You don't want to get dehydrated! You will notice I don't have a coverup or bathing suit on this list...that's because I have TWO posts on that coming up on Thursday and Friday! Get excited! 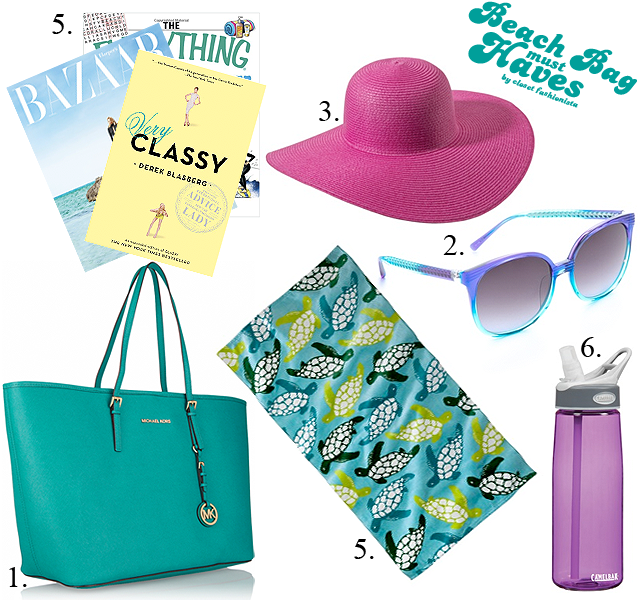 Water and a good book (or two) definitely top my list as beach essentials! I love that Michael Kors tote and my favorite things to do on the beach are read and nap, so a good book is definitely a must! ohhh that is definitely a gorgeous tote. Books and magazines are a must! Sunscreen is a must. I thought it was hard for me to burn and one beach outing long ago I ditched the sunscreen and paid the ugly price. really love that pink floppy hat - I should get some more colored hats instead of sticking to neutrals! Great beach packing list! I'm headed to the beach for the 4th as well! So excited! Awesome list for the beach! Love the tote! i need to get my hands on a big floppy hat! Oooh great list of items!!! Totally agree about the sunscreen!!! i love the fourth!! !such a festive holiday! !